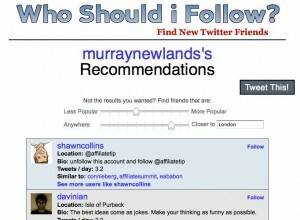 Twitter Apps: Who Should I Follow? Twitter Apps like Tweet Deck and Hoot Suite help you manage your Twitter Followers, and we can all find countless people offering ways to grow the number of our Twitter Followers. One thing you don’t find a lot of Twitter apps for is how to find new people that YOU should Follow. Enter one of the best Twitter apps I have found lately: Who Should I Follow? Who Should I Follow? will help you in your quest to Follow the people you should be Following. Basically, this Twitter app analyzes who is Following you, who you are Following, and makes suggestions for who you should Follow based on a variety of criteria (namely popularity and physical location). If you are looking to raise your visibility, find other Tweeple in your area, or just grow your Twitter effectiveness by Following quality people, Who Should I Follow? stands out amont available Twitter Apps. Who Should I Follow? Is run by Gary Elliott (@gary), Mike Champion (@graysky) & Aaron Cohen (@unlikelywords). You can find Who Should I Follow? on Twitter at @wsif.